Clinical events committees (CEC) are used routinely to adjudicate suspected end-points in cardiovascular trials, but little information has been published about the various processes used. We reviewed results of the CEC process used to identify and adjudicate suspected end-point (post-enrolment) myocardial infarction (MI) in the large Platelet Glycoprotein IIb/IIIa in Unstable Angina: Receptor Suppression Using Integrilin (Eptifibatide) Therapy (PURSUIT) trial. The PURSUIT trial randomised 10,948 patients with acute coronary syndromes to receive eptifibatide or placebo. A central adjudication process was established prospectively to identify all suspected MIs and adjudicate events based on protocol definitions of MI. Suspected MIs were identified by systematic review of data collection forms, cardiac enzyme results, and electrocardiograms. Two physicians independently reviewed all suspected events. If they disagreed whether a MI had occurred, a committee of cardiologists adjudicated the case. The CEC identified 5005 patients with suspected infarction (46%), of which 1415 (28%) were adjudicated as end-point infarctions. As expected, the process identified more end-point events than did the site investigators. Absolute and relative treatment effects of eptifibatide were smaller when using CEC-determined MI rates rather than site investigator-determined rates. The site-investigator reporting of MI and the CEC assessment of MI disagreed in 20% of the cases reviewed by the CEC. End-point adjudication by a CEC is important, to provide standardised, systematic, independent, and unbiased assessment of end-points, particularly in trials that span geographic regions and clinical practice settings. Understanding the CEC process used is important in the interpretation of trial results and event rates. MI is an important end-point in clinical trials. The prevention of MI has in fact been the primary treatment effect assessed in recent trials of antiplatelet and antithrombin therapies [1,2,3,4,5,6,7,8,9,10,11]. CECs are now commonly used to adjudicate suspected end-point events in cardiovascular clinical trials. Limited information has, however, been published about the classification of the cause of death [12,13,14,15,16] or the adjudication of nonfatal end-points [17,18,19,20,21,22,23,24] in these trials. The rates of end-point events can vary considerably depending on whether committees merely confirm events reported by investigators or whether they adjudicate all suspected events identified by data screening. In the PURSUIT trial , a central, independent CEC systematically identified and adjudicated all suspected non-fatal MIs that occurred after enrolment and through a 30-day follow-up. The rationale for CEC adjudication was the need for a systematic, unbiased, independent, and standard assessment of this end-point in a large, international trial. To understand the role of such a committee, and to provide recommendations for future efforts, we reviewed the results of the CEC process used in the PURSUIT trial to identify and adjudicate suspected end-point MIs. The PURSUIT trial  enrolled 10,948 patients at 726 hospitals in 27 countries from North America, Latin America, Western Europe, and Eastern Europe. Patients with acute coronary syndromes without persistent ST-segment elevation were randomly assigned to placebo or eptifibatide. The inclusion and exclusion criteria, as well as treatment regimens, have been published elsewhere . The primary end-point was a composite of death or non-fatal MI (or reinfarction in patients with MI at enrolment) by 30-day follow-up as adjudicated by the CEC. The composite end-point was also calculated using the site investigator determination of MI from case report forms. We assessed the incidence of end-point (post-enrolment) MI among all 10,948 patients enrolled in the PURSUIT trial. The definition of end-point MI included a first MI (for patients without MI at enrolment) or reinfarction (for patients who had a MI at enrolment), according to clinical, electrocardiography (ECG), and laboratory criteria (see Appendix). A MI present at enrolment was not considered an end-point MI and was not adjudicated by the CEC. Data were collected using standard case report forms. Additional information collected from all patients included cardiac enzymes, ECGs (performed at the time of the qualifying episode, at enrolment, at 24 hours, at first hospital discharge, and at 30-day follow-up), revascularisation procedure reports, details of ischemic episodes, clinical complications, medications, and readmission records. All enzyme values for each patient were reported; study monitors then verified them against source documents. Site investigators were asked to submit supporting documents for patients with suspected MI, which included discharge summaries and additional ECGs during the suspected event. Progress notes and procedure notes were also collected if necessary. An independent, blinded core laboratory read the specified ECGs and identified suspected MIs, defined as new Q waves ≥ 0.04 s in two contiguous leads. Overall, data for creatine kinase-myocardial band (CK-MB) were missing for only 26 patients (0.2%), data for baseline ECG were missing for 44 patients (0.4%), and data for later ECGs were missing for 36 patients (0.3%). The CEC was a group dedicated to event adjudication within the North American Trial Co-ordinating Centre at the Duke Clinical Research Institute. The group consisted of a managing supervisor, clinical coordinators with a nursing or clinical research background, administrative assistants, cardiology fellows, and cardiology faculty members. The CEC helped define clinical end-point events, helped develop computer algorithms to identify patients with suspected end-point events from data from case report forms, worked with monitoring groups to collect supplemental medical records for event review, and adjudicated suspected clinical end-point events. 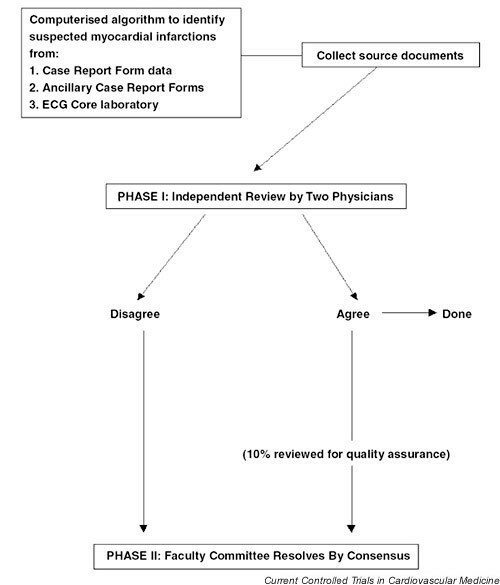 A schematic diagram of the clinical event adjudication process is shown in Figure 1. Computer algorithms systematically identified key variables from the database that could indicate the occurrence of a post-enrolment (end-point) MI. These variables, which were determined from clinical expertise and trial experience, included elevated cardiac enzymes, ECG core laboratory identification of suspected MI, recurrent ischemic events, urgent revascularisations, or site investigator assessment of a post-enrolment MI. The system was designed for broad identification of all patients with possible MI after enrolment. A report of all patients with suspected end-point MI was generated according to 'hits' on the variables already listed. Process for review of suspected clinical events in the PURSUIT trial. ECG, Electrocardiography. Each patient with a suspected MI had a clinical folder prepared by CEC staff at the Duke Clinical Research Institute. Folders included the case report form and ancillary data forms, discharge summaries, cardiac enzyme results, ECGs, and a data worksheet that summarised clinical events, procedures, and cardiac enzyme information. Medical records were translated into English if necessary, using physicians literate in the other language when possible. Each case was reviewed independently by two physicians blinded to treatment in the phase I review. The case was classified as resolved if the physicians agreed that a MI had or had not occurred. Cases in which there was disagreement between the two CEC physicians were forwarded to a second-level (phase II) review for adjudication by consensus of a committee of faculty cardiologists (Fig. 1). The committee members were also blinded to treatment and to the result of the phase I review. Physicians could request additional medical records, if necessary, to adjudicate a suspected event. If additional records were obtained, the case was re-reviewed to ensure that decisions were based on similar documents. For quality assurance, 10% of the cases with agreement by the phase I physicians were reviewed in a blinded fashion by the phase II committee to determine whether there were any systematic inconsistencies with the phase I reviews. There were no inconsistencies found. Variables were summarised as percentages for dichotomous variables or medians (25th and 75th percentiles) for continuous variables. The Χ2 test was used to calculate P values. Overall, 5005 patients with suspected MI after enrolment (46%) were identified and adjudicated by the CEC. Table 1 presents the number of patients enrolled and the number of patients with an end-point MI identified by the CEC or the site, both or neither, by geographic region. The proportion of patients with MI adjudicated by the CEC was similar in North America, Latin America and Western Europe, but tended to be higher in Eastern Europe. Data presented as n (%). CEC, clinical events committee; MI, myocardial infarction. As expected, because of the rigorous effort by the CEC to identify all suspected MIs for adjudication, the process identified more end-point events than did the site investigators (Table 2). Eptifibatide reduced the incidence of death or MI in the PURSUIT trial by 1.5% (15.7% versus 14.2%; P = 0.042) at 30 days . This benefit was driven primarily by a reduction in nonfatal MI. We noted smaller absolute and relative treatment effects when the CEC-determined MI rates were used compared with the site investigator-determined rates. The proportion of patients enrolled who had a suspected end-point MI ranged from 41% in North America to 50% in Western Europe (Table 3). Disagreements between the site investigator and CEC assessment of MI occurred in 9% of all patients enrolled in the trial, or 983 of the 5005 patients with suspected MI adjudicated by the CEC (20%; Table 3). Of these 983 patients with disagreements, 816 patients had a MI assessed by the CEC but not by the site investigator, and 167 patients had a MI identified by site investigators but not by the CEC. The review of the clinical-events classification process in the current study raises some important issues for clinical investigators. First, the rates of end-point infarction or re-infarction were higher than those reported in prior trials of patients with acute coronary syndromes. Second, the CEC identified more events than the site investigators. Third, the site investigator and the CEC assessments of MI disagreed for 20% of the patients reviewed by the CEC. CECs have become an integral aspect of clinical trials of new therapies for patients with acute coronary syndromes. The primary function of these committees has been to systematically adjudicate nonfatal end-points such as MI. The first large trials in these patients used mortality as the primary end-point; thus, standardised assessment of patient outcome was not required [25,26,27]. More recent trials, however, have included nonfatal end-points such as MI, congestive heart failure, stroke, or safety measures as part of composite clinical end-points. Myocardial infarction has been considered a 'hard' end-point, but its assessment can be as difficult in clinical trials as it is in clinical practice, because clinical, laboratory, and ECG data may conflict and physicians often disagree whether a patient has suffered a MI. An example of this difficulty is the evaluation of small enzyme elevations in patients undergoing percutaneous coronary intervention . Although these low-level enzyme elevations are defined as MIs in many trial protocols, physicians do not consistently consider them to be infarctions in daily clinical practice and therefore may be reluctant to report them as such. The rates of infarction as adjudicated by the CEC in the PURSUIT trial were higher than reported in previous trials of patients with acute coronary syndromes, for several reasons [1,7,8,29]. First, the PURSUIT trial CEC effort was more liberal in its identification of possible events. Committee physicians reviewed events for almost 50% of the patients in the trial, which is nearly double the percentage that underwent adjudication by the same CEC group in two other trials: Integrilin to Minimize Platelet Aggregation and Coronary Thrombosis (IMPACT-II) , and Global Use of Strategies to Open Occluded Arteries in Acute Coronary Syndromes (GUSTO-IIb) . Second, the definition of MI is evolving and has varied among clinical trials in this patient population. For example, criteria for MI after bypass surgery in the GUSTO-IIb trial were more stringent than those in the PURSUIT trial, requiring two of three criteria to be met (CK or CK-MB fraction ≥ 5 times the upper limit of normal, two new Q waves, or new regional wall-motion abnormalities). Finally, more cardiac enzyme samples were collected per patient in the PURSUIT trial than in GUSTO-IIb (median [25th, 75th] 4.5 [3,7] versus 3 [1,4]) (RAHarrington, unpublished data). These factors, particularly the systematic collection of cardiac enzymes (missing for only 0.2% of the patients), contributed to a higher ascertainment of MI in the PURSUIT trial. Trials that rely on investigator-reported MI probably underestimate the true event rate. Before implementation of the CEC process, the International Steering Committee agreed on the definitions for MI, which were based on experience and clinical expertise. Because of the global nature of the PURSUIT investigation, attempts were made to model definitions after everyday clinical practice. The study protocol provided the end-point definitions, so that the CEC and site investigators had the same set of criteria to classify MI. Nevertheless, the site investigators underreported infarctions. Similar findings have been noted in prior trials [1,9,22,23,30,31]. The strategy used to identify suspected infarctions can affect the proportion of events with disagreements. Some trials have confirmed events reported only by the investigators [5,7,8,11,29,30], whereas other trials have adjudicated all suspected events identified by systematic screening of patient data [1,2,3,9,31,32]. In the first strategy, the CEC event rates will be the same as or lower than the site investigator-reported rates. In the second, the CEC event rates may be higher, lower, or the same as the site investigator-reported rates. The impact of adjudication of cases from other regions of the world by physicians based in North America is unknown. In the current study, however, medical records were translated to English, physicians fluent in other languages were used when needed, and the criteria for re-infarction were based, for the most part, on objective data such as enzyme and ECG data. There are several key implications of these findings. The strategy used to identify and adjudicate end-point events is one of many factors to be considered when comparing event rates between clinical studies. During trial planning, the events classification strategy being considered may also have an important impact on estimation of event rates and the calculations of sample size and power. Education and training of clinical investigators regarding end-point definitions and ascertainment may help in minimising differences between CEC and site investigator assessments of end-points. Finally, the strategy and rigor of the clinical event adjudication process used may influence the interpretation of trial results by the clinical and regulatory communities. We believe that CEC adjudication of suspected nonfatal MI end-point events is important to provide independent, unbiased, standard, systematic assessments, particularly in trials that include broad geographic regions and different clinical practice settings. Nonfatal MI, inherently undesirable, is an important clinical event and an important component of clinical trial end-points. CEC adjudication of infarction is necessary to provide standardised, systematic, independent, and unbiased assessments of end-points in clinical investigation. In the PURSUIT trial, the assessment of infarction by site investigators versus that of a central CEC disagreed: more infarctions were identified by the CEC than by the site investigators. The impact of these findings affects the comparison of event rates between trials as well as the design of future trials. Myocardial infarction is defined by either enzyme or electrocardiography (ECG) criteria. Myocardial infarction (MI) events without documentation of a prior MI during the admission: creatine kinase-myocardial band (CK-MB) elevated above the upper limit of normal (ULN) and ≥ 3% of total CK. If CK-MB is unavailable, then total CK > 2 × ULN. If <18 hours since previous MI. Recurrent, severe ischemic discomfort and new or recurrent ST-segment elevation ≥ 0.1 mV in at least two contiguous leads, either persisting for ≥ 30 min. If ≥ 18 hours since previous MI. Re-elevation of CK-MB to above the ULN (if prior CK-MB was within normal range) or > 50% above the prior level (if prior CK-MB was above the ULN). If CK-MB is unavailable: either total CK ≥ 2 × ULN and increased by ≥ 25%; or ≥ 1.5 × ULN and increased by ≥ 200 IU above the previous value. Periprocedural MI events (occurring during or <24 hours after percutaneous coronary intervention): CK-MB ≥ 3 × ULN and >50% above the prior nadir value. If CK-MB is unavailable, then total CK ≥ 3 × ULN. Perioperative MI events occurring during or <36 hours after bypass surgery): CK-MB ≥ 5 × ULN (or CK, in the absence of CK-MB). New, significant Q waves or Q-wave equivalents ≥ 0.04 s in at least two contiguous leads. If enzyme or ECG data are unavailable, a MI is considered to have occurred when there is a preponderance of clinical evidence based on patient signs, symptoms, ECG changes, and pathological findings. When enzyme or ECG criteria are available, they take precedence. = Platelet Glycoprotein IIb/IIIa in Unstable Angina Receptor Suppression Using Integrilin (Eptifibatide) Therapy. The PURSUIT study was funded by grants from COR Therapeutics (South San Francisco, CA, USA) and Schering-Plough Research Institute (Kenilworth, NJ, USA).